Sales of 2015 American Silver Eagles, one of the world's most popular bullion coins, topped an all-time record. By the end of production for 2015, the United States Mint recorded a total of 47 million American Silver Eagles struck during the course of the year; the last 2015-dated American Silver Eagles were sold on December 15, 2015. In fact, the new record was broken on November 30, when production of 2015 eclipsed the previous record of 44,006,000 coins, a feat accomplished in 2014. 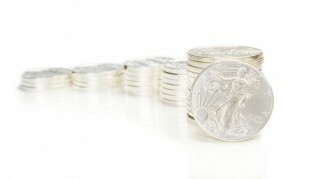 The top five years for American Silver Eagle sales have occurred since 2010, with only 2012 falling behind just a tad in terms of top-ranking sales figures. January 2015 saw the largest single-month production total for the year, with 5,530,000 coins; May was comparatively anemic, with the low total of 2,023,500 Silver Eagles produced during that month. Robust supplies of new Silver Eagles were rolling off the presses during most months of 2015. In July, for example, which marks a period when silver bullion prices tumbled and demand for Silver Eagles soared, some 5,529,000 pieces were distributed, followed by 4,935,000 in August. While there is no indication yet as to how the market will play out in 2016, it's safe to say that the year will at least start out strong. Silver prices continue to hover between $13 and $15 an ounce, representing an affordable price point as compared to the higher bullion values in recent years, which saw silver spike as high as nearly $50 in spring 2011. Silver could indeed still dive lower, which may further promote buying activity; if silver prices increase significantly, that could also persuade investors to jump aboard before prices get too high. What really seems to be driving the record production of American Silver Eagles in recent years is marked movement up and down. If the silver market stays relatively quiet, American Silver Eagles tend to fall off the radar screen for many potential buyers, especially those outside of the traditional coin buying and investing markets. When silver prices lurch up or down, even just by one or two dollars over a few days, that is when buyers come out of the woodwork. If 2016 is a period of relative peace and quiet in the silver market, then this may not be the year when American Silver Eagle sales hit the 50 million mark. However, if the bullion world goes berserk and silver ends up hitting the $20 mark again or slips under $10 for the first time in several years, 2016 American Silver Eagles sales could be off the charts.